This book covers all the basics of inspection and testing and clearly explains all the legal requirements. It not only tells you what tests are needed but also describes all of them step-by-step with the help of colour photos. Sample forms show how to verify recorded test results and how to certify and fill in the required documentation. The book is also packed with handy advice on how to avoid and solve common problems encountered on the job. 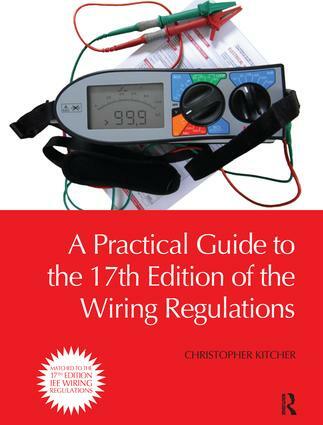 With its focus on the practical side of the actual inspection and testing rather than just the requirements of the regulations, this book is ideal for students, experienced electricians and those working in allied industries, such as plumbers and heating specialists, kitchen and bathroom fitters, alarm installers and others, whether they are working on domestic or industrial installations. All the theory required for passing the City & Guilds Level 3 Certificate in Inspection, Testing and Certification of Electrical Installations (2391-01) is covered. The book also includes sample questions and scenarios as encountered in the exams. Questions encourage readers to research answers in the On-Site Guide, as required in the exams for Part P Competent Person courses from EAL, NICEIC, NAPIT, BPEC and others. Model answers are provided for all questions. The book will also help prepare students on City & Guilds 2330 Level 3 courses, NVQs and apprenticeship programmes for their practical inspection and testing exams. Chris Kitcher is an Electrical Installation lecturer at Central Sussex College and has 45 years of experience in the electrical industry. "Whether an experienced electrician testing large industrial or commercial installations or a domestic installer altering or adding to installations, Chris has got it covered for you." Chris Kitcher has 50 years experience in the electrical industry. He is an electrical installation lecturer at Central Sussex College and an NICEIC inspector for the Microgeneration Certification scheme (MCS). For the last 17 years he has worked in the college environment whilst maintaining his electrical skills by periodically working on site.